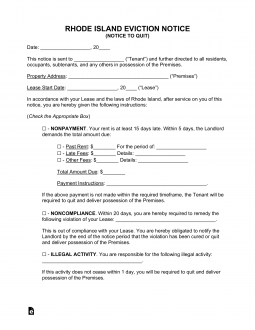 The Rhode Island eviction notice forms are for use when a tenant is violating the terms of the lease and landlord needs to inform the tenant so that tenant can either take action to rectify the problem, or the tenant can move out. Landlord must wait the requisite time period before proceeding with any further eviction action. Once the time period has expired, landlord can go to the District Court that represents the area in which the property is located in order to file a Complaint for Eviction for Non-Payment or Complaint for Eviction for Other than Non-Payment. The court will set a hearing date at which point both parties will have the opportunity to be heard. If the judge finds in favor of the landlord, he or she will issue a Judgment for Possession which give the tenant five days to move out or appeal. 24-Hour Notice to Quit (Illegal Activity) – This form is to inform the tenant of imminent eviction proceedings if they do not leave the premises immediately due to illegal activity. 5-Day Notice to Quit (Non-Payment) – Pursuant to § 34-18-35 this type of notice cannot be issued until rent has been at least fifteen (15) days late. 20-Day Notice to Quit (Non-Compliance) – This form is for use when a tenant is breaching a lease, other than for non-payment of rent. Tenant will have 20 days to cure before landlord can proceed with eviction proceedings. Note: If the Tenant conducts the same violation within the last six (6) months this notice can be modified to be incurable and the tenant will be forced to vacate the premises. 30-Day Notice to Quit (Month to Month Tenancy) – This form is for use when a landlord seeks to inform a tenant that he or she does not intend to renew a month-to-month tenancy. Rent is due on the date set forth in the rent, however, a landlord may not send notice to tenant that the rent is late until fifteen (15) days after the due date. Step 2 – Once the landlord has waited the requisite waiting period, then he or she can file a complaint with the Local District Court. There are two types of complaints depending on the reason for eviction. For non-payment use a Complaint for Eviction for Non-Payment. For another type of breach, use a Complaint for Eviction for Other than Non-Payment. Step 3 – After the tenant has been served the Complaint they will have the right to reply to the court with the Answer Form. Step 4 – At the hearing, the landlord will have to demonstrate that he served the notice properly and that he waited the requisite time period and that the tenant is in fact in breach of the lease. The tenant will have a chance to rebut the claims of the landlord. Step 5 – If the judge finds in favor of the landlord, he or she will issue a Judgment for Possession which give the tenant five days to vacate the property or appeal the judgment. Step 6 – If tenant hasn’t appealed or vacated by the end of the 5th day, an execution for eviction will be issued giving constable 5 days to remove the tenant. You will need the Signed Lease and the “Rhode Island Notice To Quit” form. This form is obtainable through the buttons (PDF, ODT, Word) below the file image on the right. Download the file type you wish to work with by clicking the appropriate button. Every intended Recipient targeted by this document must have his or her Name presented on the long blank line at the top of the page. The Location of the Premises currently being occupied by the Recipient must be documented on this Notice. Locate the statement with the opening phrase “The premises herein referred…” Use this sentence to report the City, County, Zip Code, Building Number/Street, and Apartment Number by entering this information in the appropriate blank spaces. The Signature Date on the Lease will be a factor that Identifies the Lease and verifies the Signature Party’s acquiescence to the terms. You will need to locate this information on the Rental Agreement then enter in the spaces provided. The six statements in this section are each a Notice which may be issued. The Landlord issuing this Notice will need to select one of the first five check boxes. Tenants using this form may only use it to terminate a Month to Month Tenancy using the last statement. If the Recipient has not paid his or her rent and you are issuing a Notice to Pay an Overdue Amount within Five Days of receiving this Notice or renounce possession of the Leased Property to the Landlord. In such a case, choose this statement then record an Authorized Agent’s Name, the Amount of Money the Recipient owes, the Dollar Amount the Tenant must pay, and the Rental Period that is covered specifically by this Dollar Amount on the spaces in this statement. If the Recipient has violated the Lease for the first time and must be warned that he or she must correct this situation or cede the Property to the Landlord in Twenty Days then choose the second check box, “Noncompliance (1st Offense)” and report the action considered a violation on the blank line. If the Recipient has violated the Lease for the second time in the same manner within the past six months then choose the third check box, “Noncompliance (2nd Offense),” and describe the offending behavior on the blank line. If the Recipient has been found guilty of criminal activity then mark the fourth box, “Illegal Activity,” and record the criminal behavior on the blank space. If the Recipient is renting a Property on a Month To Month basis and must be informed this agreement will be Terminated by the Landlord then choose the fifth box, “Month To Month Tenancy – I am your Landlord,” and report the last active Day of the Month To Month Tenancy Agreement. If the Recipient is a Landlord who must be informed that his or her Tenant intends to return the Rented Property and cease renting on a Monthly basis then check the sixth box, “Month To Month Tenancy – I am your Tenant,” and report the last active day of the Month To Month Tenancy Agreement will be in effect. The Disclosure contained in the paragraph will require a Signature from the Landlord/Agent issuing this Notice. If this is the entity issuing the document, then he or she must Sign his or her Name on the Landlord/Agent Signature Line. This document’s Delivery may only be validated by the Agent of Delivery in the “Certificate of Service” section. The statement in this section must have the Date of Delivery and Delivery Recipient recorded. Underneath this, the Agent will select a statement that best describes the Delivery Action. This may be a successful first party delivery, second party delivery, or a USPS First Class Mail Delivery.